The AquaFarm is the first hydroponic home unit, created more than 25 years ago by Lawrence Brooke, in California. Since 1975, thousands of these remarkable units have been sold worldwide, bringing satisfaction to their owners and growing thousands of beautiful, healthy plants. These pots have several applications: in nurseries or indoor gardens for mother plants and collectibles, in the house for decorative or culinary plants of all sizes, or in the kitchen for aromatic herbs to use fresh while cooking. They are used in research laboratories and universities and even in schools where studying plants growing hydroponically fills children and adults with wonder. 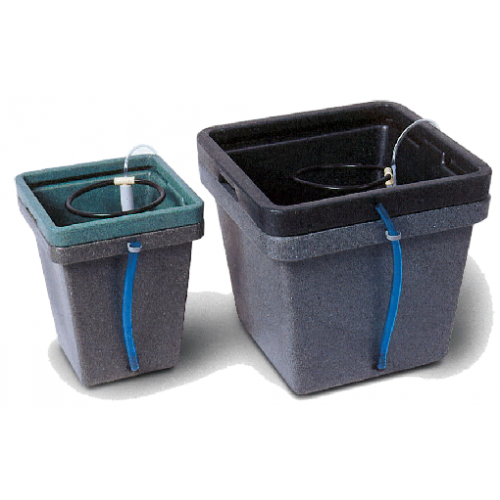 Technically similar to the AquaFarm, the WaterFarm differs only in size and price. Plants are grown within a chamber filled with clay pebbles. The growing chamber is suspended above a reservoir filled with nutrient-enriched water. An air pump drives the nutrient solution up through the pumping column, to the drip-ring, where it then drips down through clay pebbles. This infuses the nutrient with oxygen and constantly bathes the roots, stimulating the plant to grow like you have never seen before.